Love the bags, will definitely use at our next event! I use this bag everyday to carry my lunch and other misc. items I need for my commute to and from work. Its durable and able to be cleaned if it gets dirty. Plus my companies logo is on the bag, free advertising on the subway!! I needed very custom bags for an event we were hosting, and custom earth promos nailed it! Definitely will work with them in the future! Recycled reusable bags are great. Saving the planet is great. But the fact that they completely personalized my bag order thru there custom process is just really cool and alot of similar companies simply can not offer. I will for sure be a repeat customer. Love this bag, cool colors and extremely durable! Bags were a hit for our conference! Love that the are recycled as well! I work for a large farmers market who only uses recycled reusable bags. We recently switched manufacturers of our bags to Custom Earth Promos and the feedback we are getting from customers is great. The bag is way more durable then the previous bags, it is a better overall size and the logo came out better as well. Needless to say we will be sticking with Custom Earth Promos! Great for every day tasks, durable and able to be washed. These bags are way more stylish then others i've seen on the internet. There custom and personalized to what I wanted. I highly suggest this company and its bags. Ever since retailers where I live charge $0.10 per paper bag and basically aren't allowed to give out plastic bags I have been using recycled reusable bags. They are better for the environment and are a hell of alot stronger then plastic bags for grocery runs. I found Custom Earth Promos through my local grocery store who uses them as there recycled reusable bag manufacturer. I now use them for my own company and have not had a bad experience yet. I highly recommend them. I recently ordered a large quantity of these bags for my company's annual convention and was very pleased with the result! We ordered a custom size and custom graphic, and a large quantity at that. We were worried about the consistency of the graphic and overall quality due to how custom the size of our order was. When we received the bags we did a personal quality control check before we started distribution and me and my staff were very impressed. I would highly recommend Custom Earth Promos for any recyclable bag order. Out Standing!! We needed 1,500 bags for a convention they were received on time and looked beautiful. Love this company! We all can save the planet, one bag at a time! Exceptional! These bags really provide maximum performance and durability! I love the water resistant coating on these bags! Could not be a better fit for my business. Really great product. So glad I found Custom Earth Promos. I am over the moon with my bags! They look absolutely amazing! These bags are awesome! And dealing with the Custom Earth Promos team was even better! Very pleased with the outcome of our bags. There is a large surface area for our logo which is great. We use a lot of there recycled bags, the RB1 model is the one that suits our companies needs best. Perfect size and style, great bag! These bags are really built for tough use! Talk about long lasting! I really love the fact that these bags are leak and spill resistant. They are the perfect fit for our company. We used this company 2 years ago for an event and I still see our bags around town. Just placed another order with them for some reusable bags and looking forward to seeing them around again for years to come! Quality in all aspects! Super impressed! Quality and craftsmanship is excellent. Logo came out perfect also. My overall rating of this company and its products is 5 stars. The customer service is great, the product was made exactly to our sample and specifications provided. The only reason I am not giving 5 stars is nothing is perfect in life. As far as recyclable bags go Custom Earth Promos is near close to perfect. I have been in the market for recycled reusable bags for some time now. The quality that these bags are made to is unmatched in the industry. The 100 GSM non-woven polypropylene craftsmanship is a step above the rest. The stitching is also done exceeding better then other recyclable bag manufacturers I have seen. For a durable bag that will last, Custom Earth Promos is your choice. Colors are very cool, the handles on the bag are just the right size. Plus I love the fact that this is a recycled product! This was uncharted territory for me and my company using promotional bags at our annual conference. Custom Earth Promos made the process fast, simple, and enjoyable. Y'all are the best! I was searching for some of these reusable bags I see everywhere at the grocery store and mall. I searched Google and came across custom earth promos. It was easy, they make CUSTOM bags which I needed and they arrived on time when they told be they would. Thanks custom earth promos! 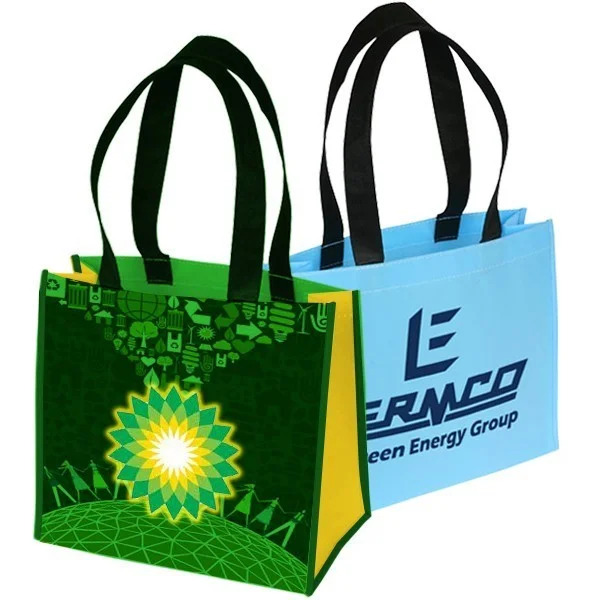 These bags and the products Custom Earth Promos offers are great! I have been in the marketing industry for 20 years and have dealt with several promotional product companies they are by far the best in the industry. The customer service I get from them is spectacular and the quality of product is unparalleled in the recycled bag industry. Not to mention by using them our company is playing a roll in saving the environment, its a win win all around working with Custom Earth Promos! Overall great experience from beginning to end. Made my job a lot easier working with such a great staff! 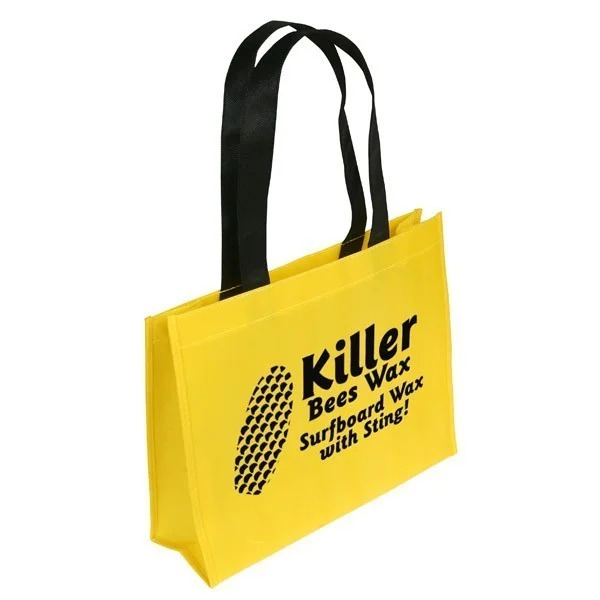 Wholesale Custom Eco-Friendly Bags from Custom Earth Promos are the first choice for businesses that demand a blend of functionality, style and quality when it comes to their promotional products. 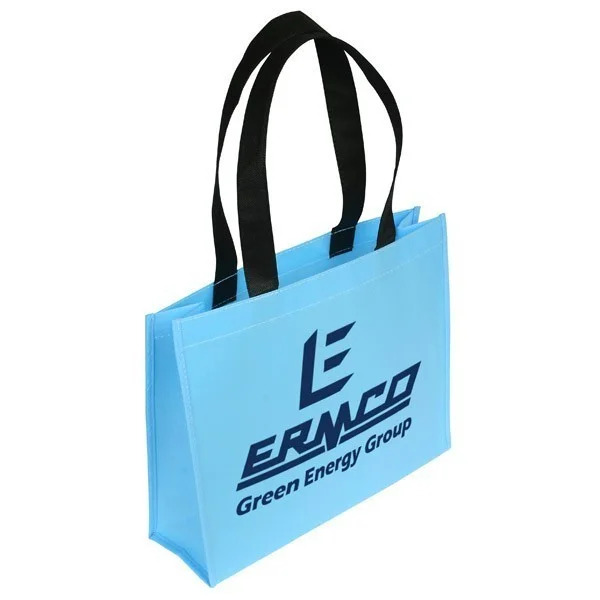 Crafted from recycled water bottles, these handy eco-friendly totes are the ultimate promotional tool, combining eye-catching aesthetic appeal with critical durability and performance that your audience will love. And we help you meet all of your marketing requirements with these customized bags designed and produced to your exact specifications. 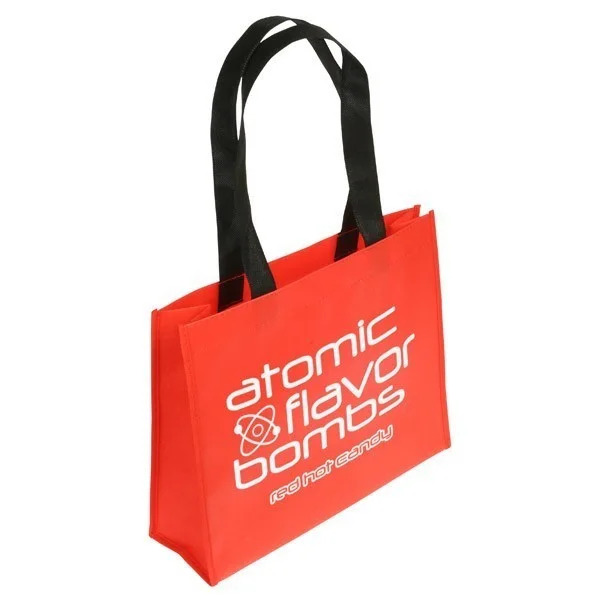 Imagine a colorful, eye-catching tote that prominently displays your brand name or logo. There’s not a thread out of place, it has long comfortable handles so it’s easy to carry—and it has a green tag, to boot. Those are just some of the features and benefits of Wholesale Custom Eco-Friendly Bags from Custom Earth Promos. Recyclable and reusable, this is a truly useful promotional item that your clients will feel good carrying anywhere. Totes have become increasingly popular over the years, among all age groups. With their generous space and large outer surface area for attention-grabbing creative artwork, these practical bags continue to find a place in homes all across the country. Built to weather rough use, you can rely on our durable Wholesale Custom Eco-Friendly Bags to last, whether your clients use them every day or just for that occasional supermarket trip. 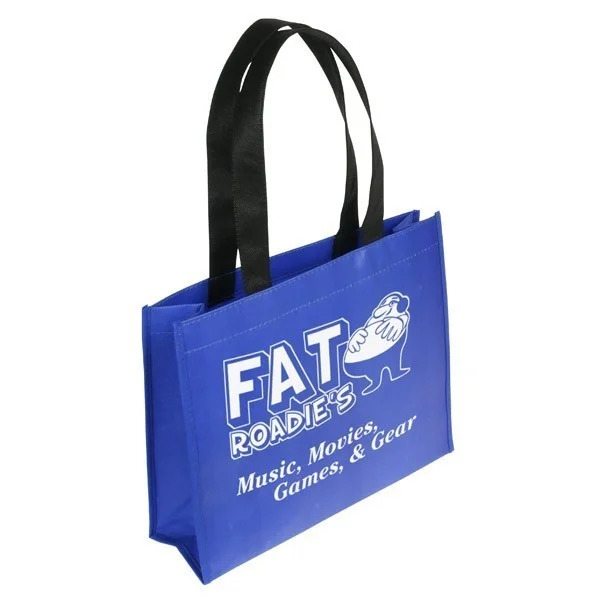 And these totes make a serious fashion statement as they promote your brand everywhere they go. In an increasingly eco-conscious world, green bags now often tend to grab more attention than expensive designer handbags. People want to carry accessories with style and substance, even they're free gifts! So we go the extra mile to ensure that every one of our recyclable bags offers the key features and quality craftsmanship you expect. Our recyclable totes offer: a 4" gusset that allows users to carry larger, bulkier items more comfortably; water-resistant coating that is impervious to spills and leaks; premium-quality reusable, recyclable 100 GSM non-woven polypropylene; comfortably long 9" handles for support and stability, and a big enough imprint area to make your brand and messaging really stand out. Custom Earth Promos emphasizes quality in every aspect of production. Our totes meet or exceed every standard of thickness, appearance, and texture. Plus all of our bags comply with California's Proposition 65 safety standards and must also pass our own stringent in-house testing to ensure maximum safety and quality. 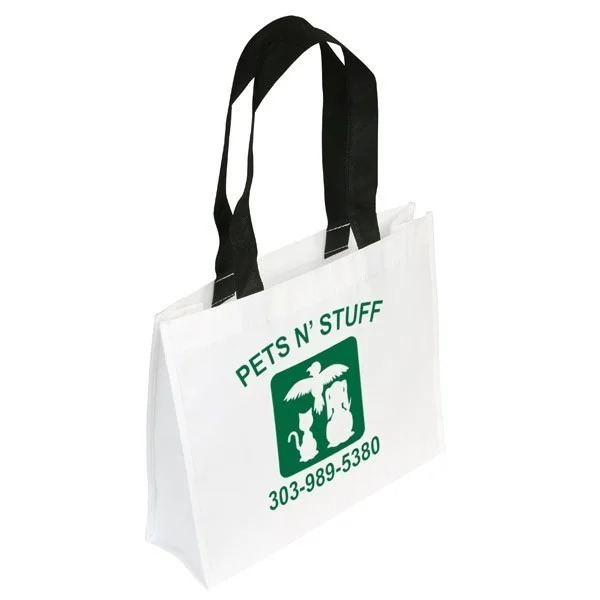 You can order recyclable totes in different colors and with customized promotional messages. Our talented design team will follow your creative brief to the last detail, so you'll always get maximum marketing value from your bags. You can order your totes in wholesale quantities at extremely affordable prices, and we pass on to you all the cost savings we get from manufacturing our products overseas! Our "eco" and "economical" designs have made us the preferred provider for many businesses across a diverse range of industries. 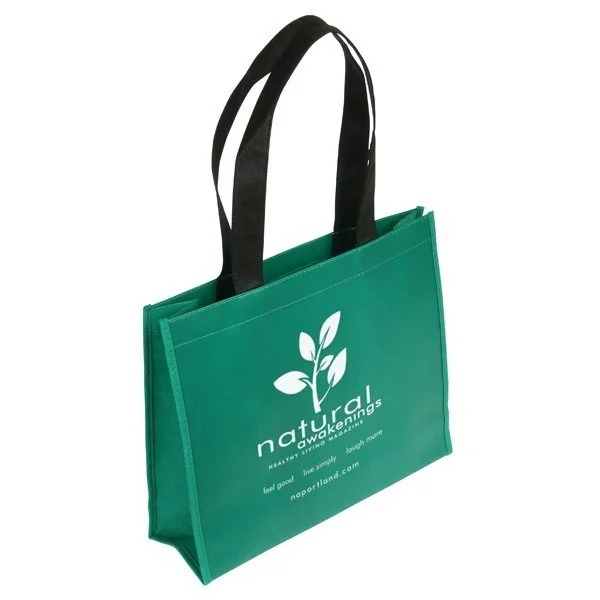 So rely on Custom Earth Promos' Wholesale Custom Eco-Friendly Bags to support your next marketing campaign—and watch the positive response from your customers and community.